Slate magazine recently featured a detailed article on fringe religious group restaurants and how for decades they’ve quietly and significantly influenced healthy, conscious eating trends across America. I’ve been to a number of these delicious, unique restaurants in LA and across the country, and it always feels like an adventure. The food is fresh and tasty, people are welcoming, the decor can be extraordinary, and you can feel there’s something special and deep going on there beyond the menu. 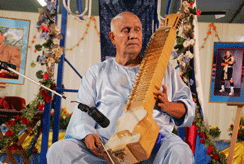 Hare Krishna restaurants are very reasonably priced and have some of the freshest natural and Vedic food you can find in large and regional cities–not to mention great gift shops. I visitedÂ Govinda’s Natural Foods Buffet in Tucson last year and the Indian food was some of the most scrumptious vegetarian Indian food I’ve ever tasted, with a salad bar as fresh as any I’ve ever found anywhere.Â AndÂ Soul Vegetarian Cafe in DC (and elsewhere) has the best vegan mac and cheese this cultist has ever consumed. 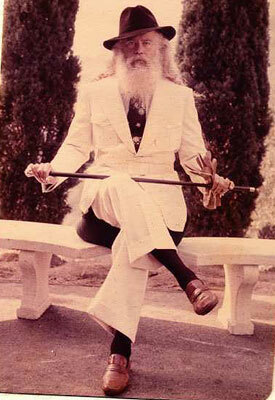 I was glad to seeÂ Father Yod prominently featured in this article. 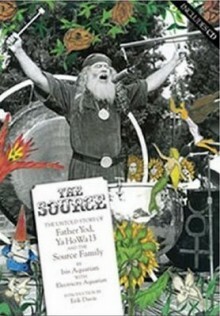 For those unfamiliar with our Process bookÂ The Source, Father Yod was founder of several influential LA health food restaurants, most notably, TheÂ Source restaurant on Sunset Boulevard, which supported his mystical commune of 140 people for several years. His restaurants made health food hip and shaped restaurant culture in Los Angeles and across the nation for many years. 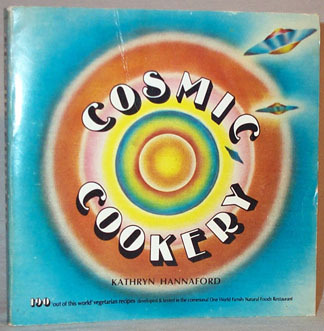 The back cover of this book shows one of the most ecstatic apron-clad UFO lovers probably ever seen in print. The recipes are good but a bit bland. 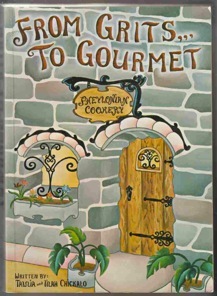 I’ve made a number of recipes from theÂ Grits to Gourmet book. The people who created this book have their own cosmology and had a spiritual family/retreat compound calledÂ Philoxia in the 70s with a restaurant and a gift shop and now run the highest quality beeswax candle company in North America.